Will My Teeth Stay In Place After Braces? Once you have your braces removed, there is a period where your teeth “settle in.” Keep in mind, we have made incredible changes in your body in a short amount of time. The bones and ligaments which hold your teeth in the mouth had to adjust in order to allow the tooth movement to occur. It takes time for the bones and ligaments to reassume the ideal relationship with the teeth in their new positions, which is why retainer wear is critical for long term stability. While some settling is common and desirable to really help stabilize your bite in the most comfortable way, there are factors which may create undesirable movement as well. Your tongue is a very strong muscle that constantly pushes against your teeth while you speak and often while you chew and swallow. These pressures can cause your teeth to move relatively easily and quickly, especially during the first 9 months after treatment has been completed. While the settling changes are normal, common and good, larger visible changes are a cause for concern. Nothing in your body ever stays still. Right now, your heart is beating, your lungs are expanding and contracting, your eyes are blinking, and all of your cells are going through their own individual life cycles as you grow or age, (depending upon how you want to look at it). By virtue of being in a living organism, your teeth are subjected to the forces you introduce, (such as eating, talking chewing and swallowing), as well as the natural changing physiologic forces within your body. The other factor in post-orthodontic tooth movement is the “memory” the ligaments and bone have. There will always be a tendency for teeth to return to their original alignment. While we can’t stop it, but we can contain it! Keeping your teeth in their corrected position is not very difficult. All you really need to do is wear your retainer as prescribed by your ARCH orthodontist. Retainers are appliances used to hold your teeth in their proper position following your orthodontic treatment. Since the human body never stops changing, the retainers hold the teeth still, so while the bones and ligaments change around the roots, the crowns of the teeth remain in the corrected beautiful position. 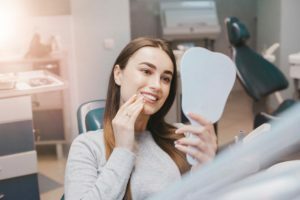 When you are not wearing your retainers, nothing can prevent movement from occurring, which means that amazing smile and healthy bite you worked so hard to achieve will begin to slip away as the teeth tend to return to their original positions. Unless you are instructed otherwise, you should wear your retainer at all times, even while eating and sleeping. The only time you should take it out is when you need to brush and floss your teeth. Typically after nine months, when the roots of your teeth are “stabilized”, you can transition from wearing your retainer from full time to nighttime while you sleep. After this year of nightly wear, you are usually able to reduce the wear to a few nights a week to a few nights a month, indefinitely. But keep in mind the more you wear them, the more stable the teeth will be and the less you wear them, the greater the risk of undesirable movement exists. Again, it is important to follow the instructions your ARCH orthodontist gives you, as the long term success of your orthodontic treatment is largely dependent on your use of your retainer after your braces. You can clean your retainer by using your toothbrush to brush both sides with hand soap or dish detergent, or even toothpaste, (but this may dull clear retainers from its abrasiveness and leave that white chalky calcium look on the acrylic and metal retainers). You can also use denture or retainer cleaner with warm water, but be sure to never use boiling water, the dishwasher or the microwave as the plastic will distort and not fit properly. For any questions or concerns regarding retainers, call ARCH Orthodontics at 1-800-28-SMILE (76453).